How to clean, descale, and unclog your shower head naturally! There are millions of cleaning products out there designed to help us clean away all the crazy buildup that water can leave on our showers, each one claiming to be better than the last. There are cleaners for soap scum, hard water, descaling, unclogging things, and polishing other things. Of course, as with most things, the best solution is the simplest! I’ve heard about this one before, but didn’t really believe that it would work that well for me, especially because we have crazy minerally well water out here. So, did it work for me? You betcha! And if it worked for me, and as quickly as it did, I’m 100% sure that it will work for you too. What a relief it is to have a shower that actually works without spraying in a billion different directions again! 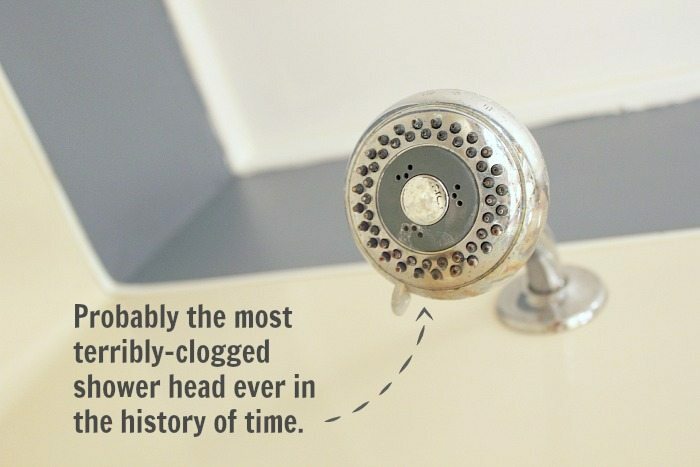 I started out with a really clogged shower head. This is the one in our older, not-yet-renovated washroom, but it’s the shower that we all use most often these days. Only about half of the little spray jets were actually working and you would almost always get sprayed right in the face when you were turning the shower on and trying to adjust the temperature. It was probably pretty funny, but it was also really really annoying. 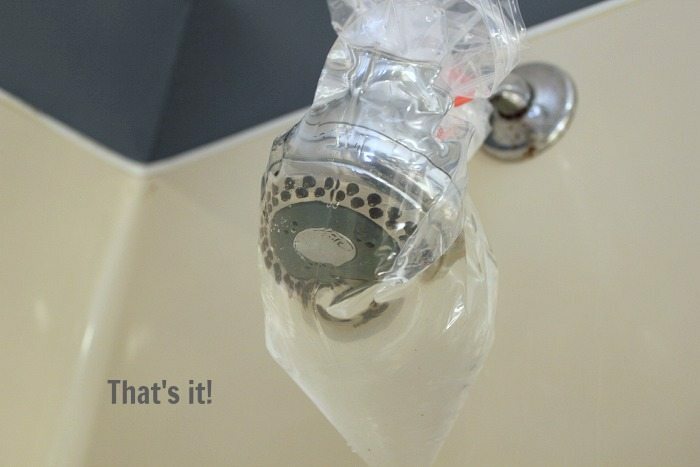 This problem is so so easy to fix and I’ll be doing this regularly from now on in both our washrooms whenever the shower head gets even the slightest bit clogged. 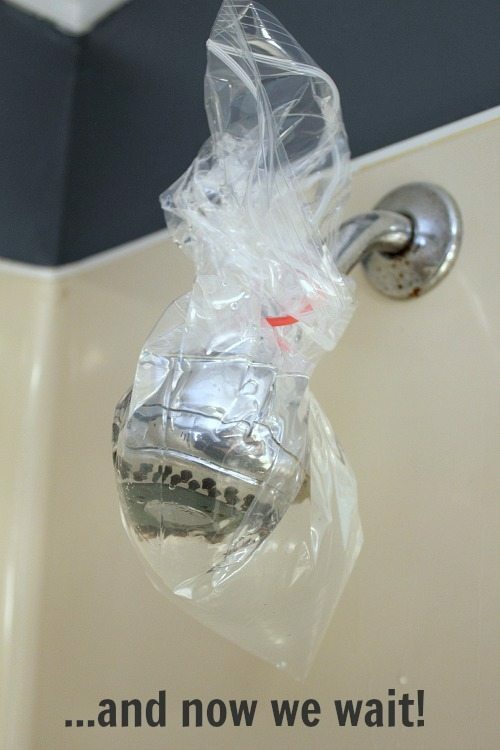 I just grabbed a large ziplock freezer bag, filled it about half full with white vinegar, and put it over the shower head so that the front of the shower head was dipped in the vinegar. Then I tied a hair elastic around the whole thing to hold it in place, and went about my day! I did this at about 8am and I planned to leave it all day before checking my results, but Chris was working on something on our other renovation in our other bathroom that morning and about an hour later he decided he wanted to take a shower. I thought I’d have to restart this experiment afterwards, but to our surprise, when he took the bag off and turned the shower on, it worked perfectly! And just like that, our shower was working like new again! 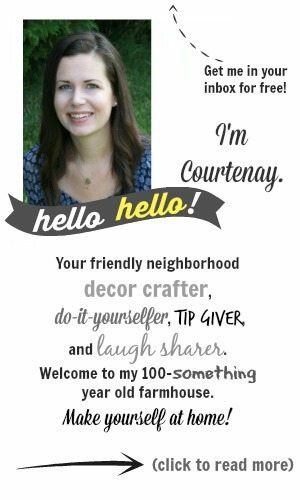 Needless to say, we’re all pretty excited about this little fix-up around here. I definitely encourage you to add this trick to your bathroom cleaning routine if you don’t do this already! For more neat cleaning tricks like how to keep your bathroom faucet shinier for longer, visit my cleaning archives! and all the cleaning hints you offer. Thank you. Yay! So glad it was useful to you, Lea! So glad you like it, Chris! Anything that can keep the bathroom clean for a little longer is a winner in my books! Yup. I get the jist… This one’s on my list! Oh no! That really surprises me! Maybe we have different minerals in our water that dissolve more quickly. Did you try leaving it on for a longer period of time? I have the worst hard water problem. Most of the shower head holes were clogged. I tried this and it worked wonderfully! Now my shower head works great! Thank you so much for such an informative article! Yay! I’m so glad, Debbie! 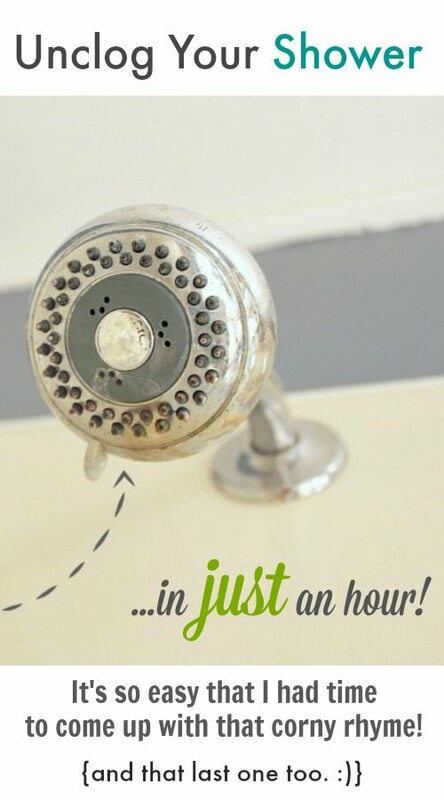 Great tips on cleaning shower head. I will have to look into cleaning mine when I get home. This sounds way easier than disconnecting the whole thing. Thanks! When I did this it unevenly dis colored the beautiful nickel plated chrome shower head that was only a year old. It is still ugly now, a few years down the road. Any suggestions? Brushed nickel fixtures are tricky to clean because of the finish used on them and how easily its appearance is altered by a lot of cleaners, even something basic like vinegar. Hopefully someone will have a solution for you to revive your finish! My shower head does not seem clogged, but there are white stains (hard water?) on the outside. It is an ORB color, but made of some sort of plastic type material I think. Would vinegar take these white stains off? Hi Donna! That’s the same stuff that gets clogged on the inside of your shower head, so the vinegar should work well for it. You’re just lucky and managed to not get any in your actual shower head! I can’t find the solution. Is it only vinegar? Or maybe a solution of vinegar and water? Really all the tips are very helpful. Thanks for this info. By the way what kind of vinegar is good for declogging. Here in the Philippines we have sugarcane vinegar, nipa palm vinegar, coconut tree vinegar. How about Heinz apple cider vinegar? How about acetic acid? I am agreed with you. It’s a really helpful article. I think I’m going to go back and make that part of the post bold. I have a question for you that is what kind of vinegar is good for declogging? Thanks for the providing such great information like these. There so many guides available on the internet claiming to help in cleaning and unclogging showerhead. I have tried all of them, but this one worked for me. Surely going to try the vinegar on my faucets. Getting worked to well water in our new place. Thank you!